Melt the butter in a small pan over low heat and add the honey mustard, garlic powder and poppy seeds. Whisk to combine and cook until slightly thickened. Slice the slider rolls in half and place the bottom layer in a 9 x 12 baking dish. Brush a thin layer of the butter poppy seed sauce on the rolls. Top with slices of roasted turkey. Layer the cheese slices on top of the turkey slices. 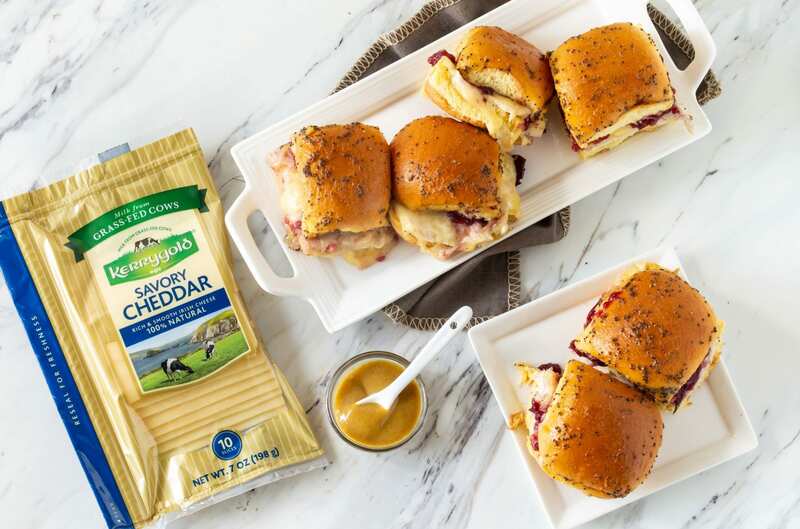 Spread the cranberry sauce over the cheese slices. Place the top layer of the slider rolls on top and brush the tops and outside with remaining sauce. Cover with foil and bake for 20 minutes. Remove the foil and bake for an additional 5 -1 0 minutes. Serve with additional honey mustard if desired.